I open this review with the realization of the unintended pun in regards to the title. Resurrection. This picture idea needed to remain dead. Don't get me wrong, I had a good laugh watching it and I was even entertained. But it's a clear example of what already began to take place in Alien 3 and takes place with many Hollywood franchises all the time. The product makes money, so you turn to the accountant types to 'package' the next version of cool aid, hence removing the originality from the product that made the big bucks to begin with. Or, we could call it a resurrection. Director Jean-Pierre Jeunet is brilliant, I like all his other movies. Truly imaginative and creative like no other films. The cinematographer, Darius Khondji, is a genius. Simply turn off the volume and watch any images from this film on their own merit. The guy's work should be hanging from a museum. The digital effects and production design were superb. The ships are believable and the environment convincing. You feel like you are in there. And finally, we get to the script. Joss Whedon's script... Ok. 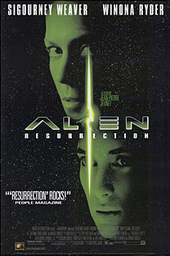 So, Alien 3 might have aimed a couple notches too far towards the dramatic aspect of what was always intended as a fun thriller with good action in it. And I am definitely a fan of Whedon's work. All that being said. Alien is not Firefly. Campy works for the space pirates, not with the legacy of Ridley Scott, James Cameron, and David Fincher. Looking back at all this highly talented pieces of the puzzle, it's easy to see why they don't fit at all. Clearly, the studio guys knew nothing of this folk's work. They were probably "packaging" this thing via their assistants. I mean, have you seen any of Jean-Pierre Jeunet's movies? I'm talking about Delicatessen and Amelie here. Go have a look. Tell me where you see an alien and a space ship in there? And Whedon's character's structure? The space pirate types? They board a military grade ship in a renegade top mission? Seriously, that was the best idea all that studio money could come up with? Look, I do own the Firefly DVD collection, I love it. But make your own judgment on this. Go watch a random episode of Firefly and then have a view of Ridley Scott's Alien. Tell me how exactly do you thread any of these elements together? We all wanna make movies and want to be part of big studio projects, but, give me a break, there comes a time to also say "I'll pass on this one. It's not for me."